Dr. Christopher Scuderi, DO is a family medicine specialist in Jacksonville, Florida. He graduated from Lake Erie College of Osteopathic Medicine 2002 and specializes in family medicine, diabetes medicine, and more. 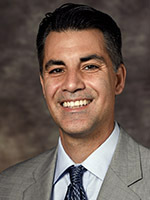 Since 2009, he has been the Medical Director and Associate Professor for Community Health and Family Medicine at the University of Florida New Berlin Family Medicine and Pediatrics.